As we close out 2016, we’re nearing that point in time where we look forward to what the future holds and then solidify commitments about changes we plan to make. From a fantasy perspective, there are few things to look forward to more than the annual Ottoneu auction, so whether you’re anxiously anticipating your very first or are committed to improving upon your second or tenth, preparation is everything. As in life, you rarely get the chance to make a second first impression, so recovering from a poor draft can be a challenge that plagues you all season long. I covered the mechanics (many of which have since been upgraded) of the Ottoneu auction last year here. We’re still roughly one month from the keeper deadline (1/31), but today I want to offer some practical suggestions (especially for those new to the game) for how to begin preparing for your auction draft. If you’re thinking about playing Ottoneu for the first time in 2017, leagues are forming daily here and here. All Ottoneu drafts are auction drafts. All Ottoneu drafts are also awesome. However, there are no mock drafts in Ottoneu, so once again, preparation is key. Feedback from first-timers is consistent: the auction moves fast. That’s said, if this season will be your first Ottoneu draft, you’re initial order of business is to ensure you actually set aside enough time to complete the auction. A typical first-year Ottoneu auction takes 8-10 hours from start to finish, so most leagues will schedule two separate evenings of 4+ hours each. The added benefit of the “break” is that you’ll have time to reevaluate your draft strategy on night two when the core of your roster is already in the books. In the unfortunate event that your league’s auction date is set and you cannot attend, some experienced Ottoneu owners have volunteered in the past to step in as an auction draft proxy. If you need a draft proxy or want to volunteer your expertise, check out the Ottoneu community and Slack group. Ottoneu 101: Production, Salary, Surplus, Value (Joe) – very helpful starting point hat will help define the basic economic aspects of the game you’re about to jump into. Player Values Across Ottoneu Formats (Chad) – Ottoneu offers four different scoring formats, and Chad walks through how player value differs in each format, which can help you narrow down the right game for you. Auction Values for Ottoneu Leagues (Chad) – Chad has done some terrific work over the past few seasons laying out his process for creating pre-auction dollar values for Ottoneu players, so this article is a great place to begin. For a much more in-depth resource, check out this link. Ottoneu Surplus Calculator (Justin) – For experienced Ottoneu owners gearing up for their spring draft, no tool is more popular than Justin’s “Surplus Calculator”, which is updated often as new projection systems become available. 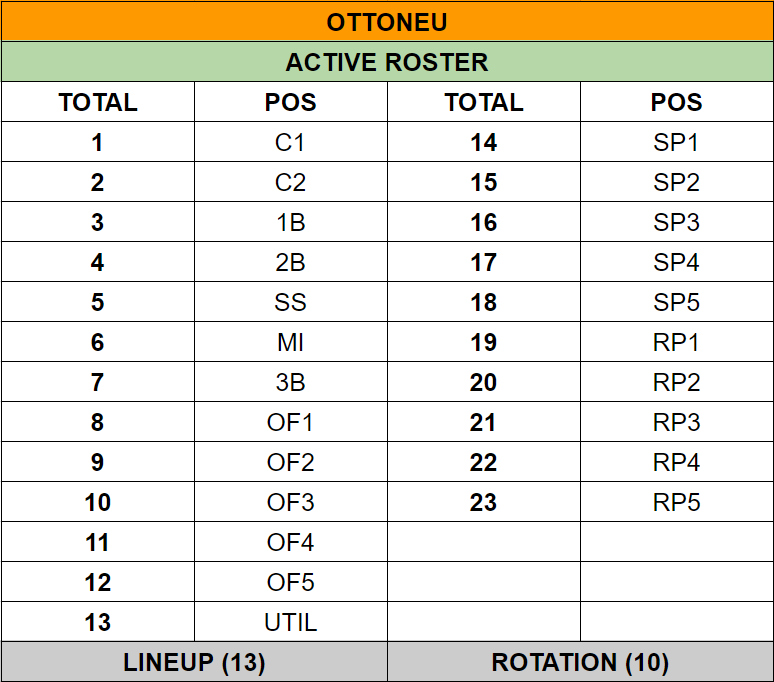 FanGraphs Auction Calculator – The FanGraphs Auction Calculator is also a nice tool, especially now that it includes some Ottoneu presets that can make the setup process much easier. How to Create a Position Cheat Sheet in Excel (Tanner) – Super practical, super helpful. 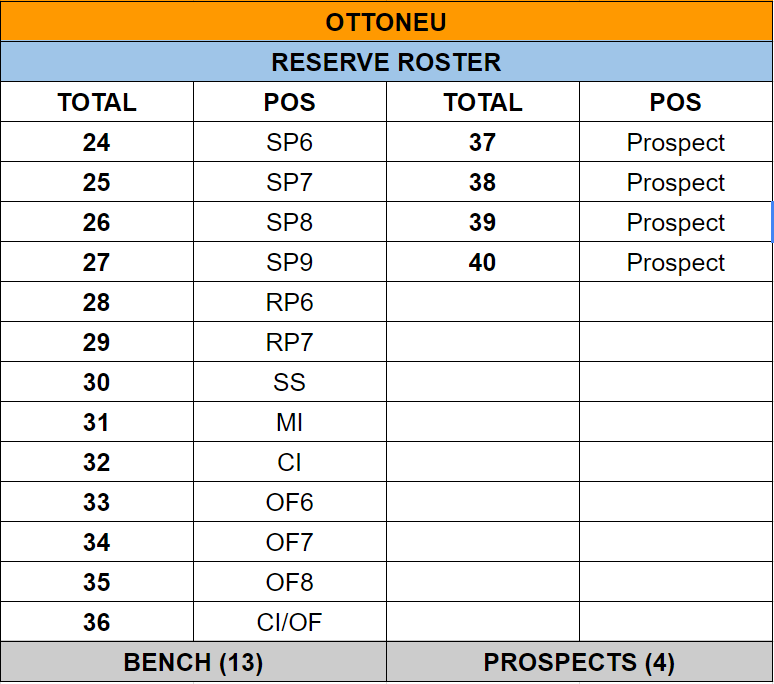 Prospect Classes in Ottoneu (Brad) – Brad does a nice job visualizing the differences in evaluating prospects here by placing them in value “buckets”. Expert Advice for Rebuilding Your Fantasy Team – Timeless, crowd-sourced advice that focuses quite a bit on the real “value” of prospects within the game. The Secret to Rebuilding Your Fantasy Team – Hindsight is 20-20, but prospects can be so shiny, can’t they? A few of my own mistakes when being blinded by prospects. Top 50 Fantasy Prospects – You can check RotoGraphs for regular prospect rankings in Ottoneu, but the Scorecard method might be most relevant here since it attempts to calculate prospect valuation within the context of your own fantasy league. The key takeaway is to develop a system for determining value for you so that you don’t accidentally miss the market (buying or selling). Hopefully the advice above is practical, but the single best recommendation I can make in preparation for your Ottoneu auction is to pre-rank players by position inside the actual draft menu. I learned this trick from Joe, and it works so well that I’m committed to doing it in every auction going forward. This pro tip works for both the rookie owner (you can still rank players based on your preferences even if you haven’t converted them to dollar values) and the seasoned Ottoneu veteran with multiple leagues on his resume, and it will not only save you time in the draft room but should help you better execute your draft strategy too. The draft site won’t be readily available until after the keeper deadline (and Ottoneu creator Niv Shah is actively working on some baseball enhancements), so I’ll wait to update this post with a picture of the player ranking menu in the auction room at a later date, but if you’ve gone through the process of analyzing, ranking, and targeting players as I’ve suggested in some of the ideas above, it only makes sense to go ahead and get those players pre-ranked in the proper order in the draft room, too. Do you have other suggestions or best practices for “winning” your Ottoneu auction? Would love to hear them in the comments. We hoped you liked reading How To Win Your Ottoneu Auction by Trey Baughn! I’m definitely curious about Ottoneu. I’m in several long term dynasty leagues, but this seems like it adds many more layers of complexity. Is it too late to jump into a league for 2017 and catch up with everything? Definitely not too late. Leagues are forming daily. If you’re curious, my first recommendation might be to check out the community site and ask as many question as you like. You don’t have to join Ottoneu to get involved in the community and get feedback from experienced players or find new owners entering their first season, etc.